Loads of stuff to natter about this week, along with 8 great tracks. 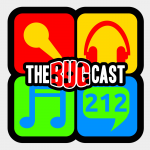 The next show will be episode 213 – broadcast live in the chatroom on Friday 1 June from 21:30 UK time. Thanks for the plug guys:). I was in the chat room last week, but my wifi signal was being odd so I kept loosing you hence I didn’t say anything. Towel day is referenced to hitchikers guide as Ford Prefect proclaims to Arthur Dent that you should always know where your towel is, douglas Addams got the line after being on holiday and a friend kept saying it because he hated getting to a sun lounger and not having a towel… He classed it at something very important in life… So he put it in the book. You should read the ok though or at least listen to the radio series (don’t bother with the film though). I’m looking at a copy of HHGTTG right now, so I’ll get reading. This is Katie from the Cyber PR® Team, and I just wanted to thank you for supporting our artist Antioquia on this podcast!